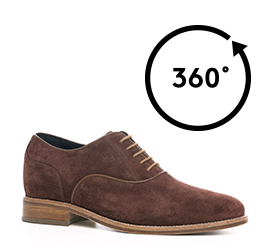 Elegant elevator Oxford handmade in Italy with upper in brown suede and Goodyear welted leather sole. An exclusive artisanal shoe featuring an invisible inner elevator system to choose from 2.4 (6 cm) up to 3.1 (8 cm) depending on needs. The GM master craftsmen allow different customization options to make the shoe even more unique.